There is a £100 ully refundable deposit required at time of booking. passes are NOT included in the price. Check in is 2pm check out is 10am. We had an absolutely fantastic stay in this lodge with our children, aged 8 and 4. Fantastic accommodation, contains everything you require and perfect location on site. We couldn't fault a thing. Tracy was fantastic to deal with throughout the booking and our stay. Couldn't do enough to help us. Thanks for letting us stay in your superb holiday lodge. Enjoyed every minute of our holiday. The caravan is absolutely beautiful, spotless clean and brilliant sea view. The caravan was equipped with everything you could possibly need and more. Will definitely be booking it again.???????? This was my first time staying in this lodge and what an amazing experience. The lodge is in a perfect location on the site very close to the bar and play area but not close enough to hear any noise. 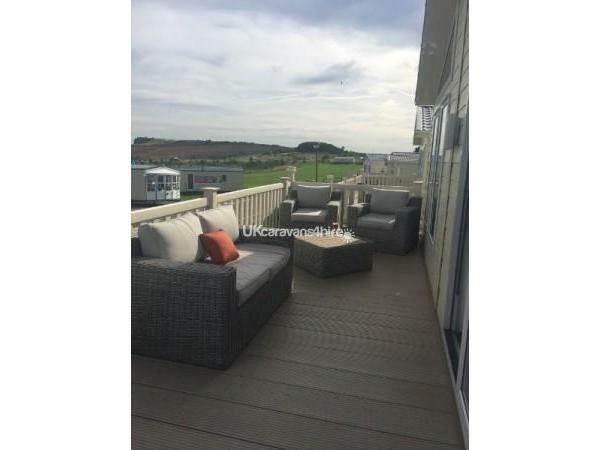 It has everything you could possibly need and more and the view from the veranda is spectacular, I loved sitting out there 1st thing on a morning with a coffee just watching the world go by it was so relaxing. The owners Tracy and Michael are lovely people to deal with and nothing was any bother to them. Could not fault a thing besides that I had to leave when my week was up. Can't wait to book again. Thank you so much for the amazing experience. I would highly recommend booking this lodge if your looking for luxury and a home from home. Outstanding Accommodation. More than Home from Home, this lodge has everything you could want and then some. Ideal location in the park with sea view from living room and balcony. Large wall mounted tv with stunning picture quality for hubby and grandson to watch the World Cup, Cosy electric wall mounted fire with living flame and mood lighting. Kitchen unbelievable for holiday accommodation, American F/F, ice and cold water anytime you want, dishwasher, washer/dryer, microwave and lots more. I could go on and on. Suffice to say, book it, you will not be disappointed. We have stayed in caravans 35 feet x 12 feet and paid more and this is 40 feet x 20 feet, feels almost like a house. Thank you for the present you brought round to us and for the most brilliant place to relax. 10/10. perfect holliday for myself son partner and.grandchildren, lodge outstanding ,excellent standard of accommodation. View from well equipped veranda was great and standard of cleanliness was perfect. situation of lodge perfect for our needs parking at the side made loading and unloading of the car ideal . Tracy made everything perfect nothing to much trouble for our stay highly recommend . Superb lodge in one of the best locations on the park. The accommodation has everything you could need and is furnished to high standard. Tracy was very helpful and quick to respond to any emails we sent. We will certainly be staying again. This is a beautiful lodge in a brilliant position on Clayton bay resort. The owners are brilliant and did everything possible to make our holiday one which we will remember. We will be returning next year. Thank you so much for your review it was a pleasure and you would be very welcome back anytime.